Fashion designers gown, dress shop South Wales, petite to plus size, eveningwear to daywear, bridal, mother of the bride. Couture designers shop and studios in Abergavenny, South Wales. Charles and Patricia Lester's designer dress and gown shop is open to the public during the week and you can visit at any time. If you cannot visit during our normal opening hours please telephone for other times and we will see if it is possible to open specially for you. In our shop you will find clothes for all occasions from eveningwear, daywear and fashion for special occasions. We also have a collection of bridal wear for the bride who wants a wedding dress that is different and special. We also have a special luxury collection of dresses, gowns, jackets that are perfect for the mother of the bride or groom. We always have a very large collection for you to choose from in stock and there is always a discount section where you could be lucky enough to find a special bargain. We also carry dresses and gowns for women of all sizes and shapes, from petite to plus size. We are within easy reach of the M4 and M5, by road and by rail. Our dress and gown boutique is only twenty miles from Hereford and Newport, thirty from Cardiff and fifty from Bristol. We are less than a 1/2 mile from the Heads of the Valleys Road making Swansea and the valley towns such as Ebbw Vale, Merthyr Tydfil, Tredegar, Aberdare and the Rhondda a short journey by car. Towns such as Carmarthen, Llandovery and Llandeilo are also a short drive as the A40 runs past the road leading to our dress shop. Monday - Friday 10 am - 4.30 pm. If you want to be on our mailing list please e-mail or telephone us. Directors: Patricia Lester M.B.E., Charles Lester. Things to do and see in South Wales and its luxury hotels and famous restaurants. Abergavenny is known as "The Gateway to Wales" and is at the start of the Brecon Beacons and the Brecon Beacons National Park. The M4 motorway makes all the South of England and home counties accessible to this unique bustling market town, vibrant in its diversity. Abergavenny is in South East Wales - not far from Cardiff, Bristol, Bath, Hereford, Newport and Swansea. There are very good rail and road links with the West Midlands, Birmingham, Oxford and the West Country (Devon, Dorset, Wiltshire, Gloucestershire, Somerset, Avon and Cornwall). From London the route is easy and direct - crossing the new Severn Bridge is an experience in itself - a wonderful giant sculpture particularly spectacular agaist dark clouds or early evening or the low light of dawn. Abergavenny is also at the hub of many famous events - the Abergavenny Food Festival now a 'must' on everybody's calendar who is interested in the culture of food. With so many things to do and see, it is worth taking time to explore the area - even Harry Potter's bus stopped at Abergavenny! It makes a great centre from which to explore the area, such as a day in Usk, famous for its wonderful floral displays throughout the town. Or perhaps a walk over the famous Blorenge Mountain - the only word that rhymes with 'orange'! The Llanfoist Open Garden day is worth a visit - a day spent exploring the wonderful gardens of the village makes an unusual and inspiring 'day out'. The Brecon Jazz Festival is only twenty miles away as is the Celtic Manor Hotel in Newport which has several golf courses and was the host to the Ryder Cup in the year 2010. The internationally famous 'Hay Literary Festival', Hay Literary Festival held at Hay on Wye, attracts many famous visitors including Bill and Hilary Clinton, who were guests at the 2002 festival. 'The Three Choirs Festival' (Hereford, Gloucester and Worcester) - a celebration of choral music, is only an hour's drive away. Abergavenny is in the heart of the county of Monmouthshire, a county that has more castles and fortified houses than any other county in Britain. For industrial history there is the famous 'Big Pit' Mining Museum in Blaenavon as well as the most glorious countryside where walking, horse-riding, both lake and canal boating, fishing - country activities too numerous to remember them all. As a contrast to the gentle countryside, Cardiff, with its Millennium Stadium and Millennium Centre provide entertainment in sport and culture in the most modern and sophisticated of surroundings in Cardiff Bay, once a busy dock area, now home to the contrasts of high profile modern living alongside the historic Norwegian Church and the new Assembly building. St Fagans Museum is a major museum of Welsh Life a worthwhile day out for those interested in social history. There are a number of places to stay from the exotic and luxurious hotel - Llangoed Hall (the inspiration of Sir Bernard Ashley: co-founder of the Laura Ashley fashion label) - to Bear Hotel in Crickhowell (winner of the British Pub of the Year Award as well as the AA Welsh Pub of the Year). Gliffaes Country House Hotel' is only five miles from the town and is set in over twenty acres of beautiful gardens. 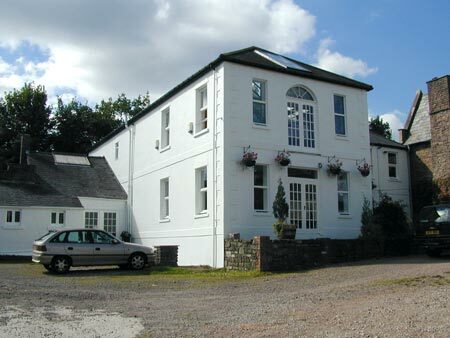 The hotel is on the banks of the river Usk, famous for its salmon and trout fishing. Extensive fishing rights on the river can be used by hotel guests. 'The Angel Hotel' has an excellent dining menu. There are many other places to stay and eat fine food. For those who want a few days of luxurious pampering there is the Celtic Manor Hotel. Here can be enjoyed the hotel's award winning spa, gymnasium, golf, tennis and several restaurants as well as a little bit of shopping.